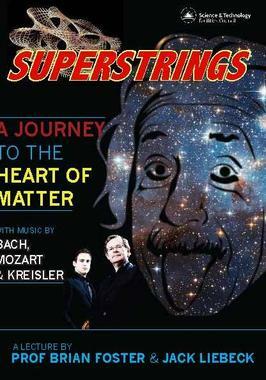 Superstrings is a lecture that links Einstein's favourite instrument, the violin, with many of the concepts of modern physics that he did so much to found. The performance begins with an introduction to Einstein's life and involvement with music and how his ideas have shaped our concepts of space, time and the evolution of the Universe. These slides are accompanied by selections from J.S. Bach's Sonatas and Partitas for Solo Violin, some of Einstein's favourite music. The lecture then proceeds with a discussion of some of our modern ideas that build on the structures of Einstein and define the so-called "Standard Model" of particle physics, in which the evolution of the Universe after the Big Bang can be understood by the interplay of a small number of fundamental forces on a few point-like "elementary" particles, the quarks and leptons, and their antimatter equivalents. At several points in the performance Jack uses his J.B. Guadagnini violin, the "ex-Wilhelmj", to illustrate some of the ideas discussed by Brian in the lecture by analogy. Although in many ways a fantastic success, the "Standard Model" leaves many questions unanswered and leads to several paradoxes. Modern ideas of Superstrings may well lead to a much more satisfactory theory, although at the cost of prediciting a whole host of new particles as yet undiscovered. Superstring theory also predicts that the universe has extra "hidden" dimensions of space whose size is so small that they are invisible to our everyday experience. Nevertheless, they may give rise to measureable effects in the next generations of "atom smashers" due to start operation at CERN in Geneva in a couple of years time. The lecture ends by looking at these possible effects and with a duet for two violins by Mozart in which lecturer and soloist join forces and pay tribute to Einstein's lifelong love of chamber music.